This business has closed down, it is now known as The Regent. 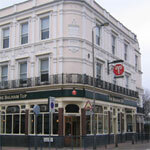 The Balham Tup is a massive open bar ideal for a quiet or a loud drink. With a Big Screen and other large TVs it’s a great place to watch all the major sporting events, and that’s before we tell you about indoor cricket! This is the best place in south London to party, The Balham Tup really knows how to rock. There is an interesting menu available every lunchtime and evening, and the Sunday lamb roasts are a highlight.